Flat roofs are always at a high risk of leaking. Rain water tends to pool in small areas of the roof and eventually leaks through, the result means paying out a small fortune on repairs. Torch on felt and asphalt deteriorate year after year from the heat of the sun and cold winters. Asphalt and Polymers age through photo-oxidation, a natural process that results in the degradation of the surface, accelerated by exposure to either UV or artificial light. As it ages, the asphalts melt point rises and there is a loss of plasticizers. As mass is lost, the asphalt shrinks and forms a surface similar to alligator skin. Asphalt breaks down slowly in water, and the more exposure the more rapid the degradation. Asphalt also dissolves readily when exposed to oils and some solvents. 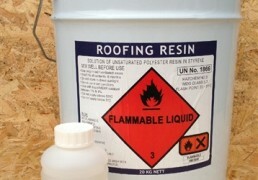 Fibreglass is perfect for flat roofs. Its strength and durability is by far the best protection for your roof. Glass Reinforced Polyester (GRP) roofing is a fibreglass based system that gives you a watertight area that would have more traditionally been sealed with lead, copper or bitumen products. 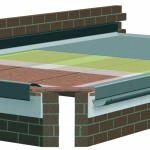 A GRP flat roof provides a cost effective solution to your waterproofing needs. Our fibre glass matting is the most common form of reinforcement used with polyester resin for hand layup. 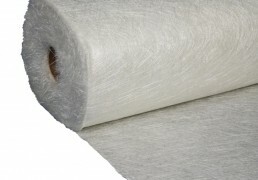 We supply fibre glass matting in rolls of 100cm widths, in a variety of grades. Our fibre glass matting can be used for flat roofing, boat building and other applications. 450g 100cm Wide and 600g 100cm Wide. 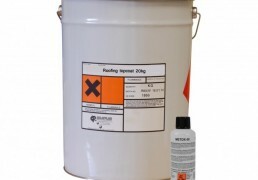 Unlike standard gelcoat, this topcoat cures tack free, so it can be used like a paint or to seal fibreglass surfaces. It has top quality physical properties, is UV light stable and water resistant and is therefore suitable for a wide range of applications and for all GRP surfaces. This product is a solvent proof, light weight aluminium roller, which is particularly effective when used on chopped strand matting. 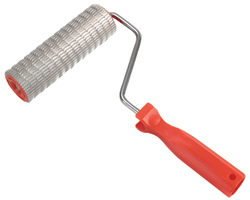 Our range of brushes and rollers are designed specifically for use with fibreglass products. 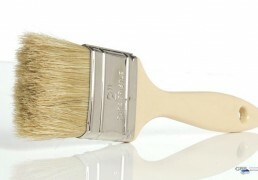 Our brushes are completely resistant to resin and acetone, with white bristles and wooden handles. We stock a range of deep pile rollers.